Malaysia Airlines (MAS) is starting to show some signs of progress in its latest turnaround effort, after a year of restructuring and almost constant adjustments to its new business plan. The carrier’s management team is confident the flag carrier will finally turn the corner in 2013 and that its upcoming entrance into oneworld particularly boosts its outlook. But MAS still faces several challenges and there is always a risk of Malaysian politics quickly erasing the positive aspects of the recent restructuring. MAS should not be banking on oneworld, which it will formally enter on 01-Feb-2013, being its panacea. Only three oneworld carriers serve Kuala Lumpur and relations with MAS’ sponsor, Australia’s Qantas, cooled significantly earlier this year after talks over establishing a new joint venture carrier ended. Project Orca, which envisioned Qantas and MAS joining forces to establish a new Malaysia-based A330 operator on routes within Asia-Pacific including Australia, was a logical solution for both carriers’ international woes. But MAS strongly disapproved of the commercial terms proposed by Qantas and now that Qantas has got into bed with Emirates it faces the prospect of the carrier which brought it into oneword emerging as a bigger competitor rather than key partner. With the benefits from oneworld not likely to come in the short-term, MAS needs to focus on further reducing costs and fully implementing the latest version of its business plan. The carrier’s restructuring is still a work in progress and by no means is MAS out of the woods. There have been several major adjustments to the MAS business plan over the last several months, including a reversal of capacity cuts and dropping plans to establish a new short-haul premium carrier. But the core component, a focus on premium services, remains the same. MAS is still investing significantly in fleet renewal as well as a product enhancements to reinforce its premium position. The original version of the new business plan, which was unveiled just over one year ago in Dec-2011, also outlined network changes which in hindsight were too drastic and sudden. The new MAS management team took a slash and burn approach, implementing a route rationalisation exercise that quickly cut ASKs by 12%. 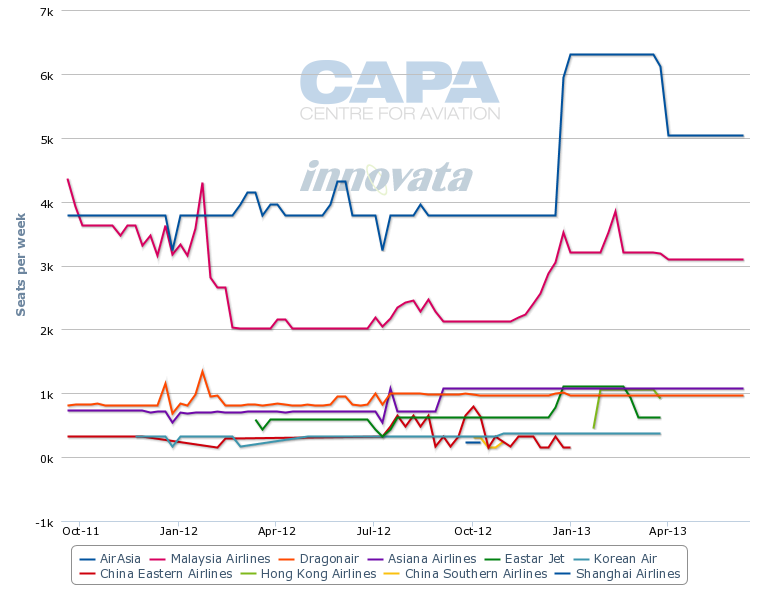 By early Feb-2012, MAS had cut 14 international routes, resulting in a 12% reduction in ASKs. The rapid nature of the cuts reduced the carrier’s efficiency as MAS was unable to reduce head count accordingly. While the fuel bill went down, the company became more bloated and saw a sharp drop in revenues. The route rationalisation exercise was necessary as MAS had several routes – particularly long-haul services to South Africa, Argentina and Italy – which were heavily unprofitable with no prospects for improvement. But the cuts were too numerous and were phased in too quickly. MAS has since reinstated some of the routes and added capacity elsewhere. MAS reported flat year-over-year ASKs in Nov-2012, indicating that capacity has already been restored to pre-restructuring levels. In Mar-2012, the first full month after the completion of the route rationalisation exercise, system-wide ASKs were down 12%, meeting the initial target. But the year-over-year monthly capacity cuts have since steadily decreased in size. In the international market, where almost all the cuts had been made, ASKs were down by 8% through the first 11 months of 2012 but only by 1% in Nov-2012. In Mar-2012, international ASKs were down just over 13% while domestic ASKs were up by less than 1%. 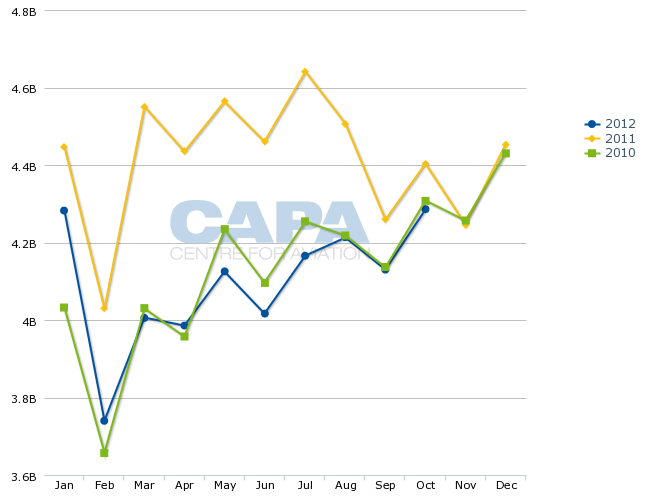 Domestic ASKs were up by 12% in Nov-2012 and by 4% through the first 11 months of the year. This is a further indication that MAS has reversed course and de-implemented an important component of its original business plan as outlined in Dec-2011. While some of the axed routes such as Buenos Aires, Cape Town, Dammam, Dubai, Karachi, Johannesburg and Rome have not been reinstated, capacity has been added elsewhere. For example capacity has increased on several regional routes including Kuala Lumpur to Jakarta and Bangkok as frequencies have been added with 737-800s and to London as A380s have replaced 747-400s on both existing frequencies. Jakarta, London and Bangkok are three of MAS’ four largest routes by international capacity. MAS also unveiled plans in Oct-2012 to reinstate in Dec-2012 two of the international routes axed in Jan-2012, Kota Kinabalu to Osaka and Perth, as part of an adjustment in its strategy for east Malaysia. MAS has not yet reinstated two other Kota Kinabalu international routes cut in Jan-2012, Tokyo Haneda and Seoul. But MAS in Dec-2012 launched Kota Kinabalu-Shanghai and increased capacity on Kota Kinabalu-Hong Kong, giving the carrier more international capacity at Kota Kinabalu, Malaysia’s second largest airport based on total capacity, than pre-restructuring. MAS is offering in the week commencing 24-Dec-2012 about 9,500 international seats at Kota Kinabalu, while it offered approximately 8,000 weekly international seats prior to the restructuring. The route restructuring programme had downgraded its secondary hub at Kota Kinabalu, leaving only two international routes (Hong Kong and Taipei). The rationale in cutting international services at Kota Kinbalu, which continued to be a domestic hub for MAS and the base for turboprop subsidiary MASwings, was the carrier should focus more of its remaining international capacity at its main hub in Kuala Lumpur as premium demand is significantly higher at the country’s largest city compared to more leisure-focused east Malaysia. Given MAS’ new premium focus, the need to slash capacity overall and the intense competition at Kota Kinabalu with LCC AirAsia, which even with the MAS reinstatements has a significantly larger international operation at Kota Kinabalu, the cuts were logical. The adjustment in the MAS business plan to reinstate the international mini-hub at Kota Kinabalu could be viewed partially as a measure to appease the government of Sabah, which protested vehemently to the cuts as they were detrimental to the region’s economy, particularly the tourism industry. But MAS is confident the routes can be profitable this time around with the right marketing efforts. In a press briefing at the AAPA Assembly of Presidents in Kuala Lumpur in Nov-2012, MAS executives said the carrier is working closely with tourism officials and its sales and marketing teams at both the origin and destination ends to ensure the success of the new and resumed international routes at Kota Kinabalu. MAS acknowledges in the past that the carrier lacked coordination in bringing together its marketing teams, tourism authorities and travel agents including online travel agencies. During 2012 MAS has become more aggressive at promoting tour packages, through its Golden Holidays division, and group traffic. This is a key component of the carrier’s turnaround effort as it looks to boost ancillary revenues and yields. While there is not as much premium demand at Kota Kinabalu compared to Kuala Lumpur, MAS believes there are business segments of the market which can be targeted and the carrier can find the right traffic mix on the routes to ensure they are profitable. MAS has decided to deploy new 737-800s on its international routes in east Malaysia, which in addition to Kota Kinabalu includes expansion at Kuching in the neighbouring state of Sarawak. The larger 737-800 comes with efficiency gains and 8% lower unit costs, as measured by CASK, as well as a more appealing in-flight product, supporting the effort to turn around previously unprofitable regional international routes. MAS is using its fast-expanding 737-800 fleet to grow and optimise its domestic and regional international networks. The earlier focus on only offering international flights at Kuala Lumpur has been dropped as the carrier is now keen on capturing point-to-point traffic from Kota Kinabalu and Kuching in east Malaysia as well as from the island of Penang off the western coast of peninsular Malaysia. Expansion in the regional international market, where demand remains strong, at all four of the carrier’s hubs could be pursued as 11 737-800s are added to the fleet in 2013. While the carrier plans to retire a similar number of 737-400s, the 737-800s are larger and have significantly higher utilisation, giving MAS the ability to expand capacity across its short-haul network. MAS was unable to pursue short-haul capacity expansion in 2012 as its 2012 fleet plan included 13 737-800 deliveries but 17 737-400 returns. MAS is planning to complete the phase out of its 737-400 fleet in 2014, having only begun the fleet narrowbody renewal process in Oct-2010 with the delivery of its first 737-800. MAS currently only offers domestic flights at Penang although its Firefly subsidiary operates four short turboprop routes to international destinations in nearby Indonesia and Thailand. Penang has huge potential for MAS-branded international operations given it is Malaysia’s second largest international airport, with 11 foreign carriers and AirAsia offering 332 weekly international frequencies (excludes the 50 weekly frequencies from Firefly). Kuching is much smaller with five carriers operating only one international route each, including MAS to Singapore, but has huge potential as Sarawak emerges as a popular eco-tourism destination. MAS recently unveiled plans to transition its daily Kuching-Singapore service from 737-400s to 737-800s in Jan-2013 and add a second daily frequency from early Feb-2013. It is also now looking at adding other international routes at Kuching during 2013. Balancing social responsibilities and commercial justifications has always been a challenge at MAS. While MAS will continue to support the government in developing more rural east Malaysia and meeting the social responsibility aspects of its role, there will be commercial constraints as markets must be able to absorb any capacity being added and MAS does not have an unlimited supply of aircraft. MAS also has reinstated some domestic routes in east Malaysia, bowing to political pressure. For example service from Sandakan, a smaller city in Sabah, to Kuala Lumpur was resumed in Feb-2012. The route had been handed over to Firefly in 2011 but was dropped when the MAS subsidiary stopped operating 737s and returned to its roots as a turboprop operator on short regional routes in Nov-2011. Sandakan-Kuala Lumpur was a highly unprofitable route which MAS did not want to resume but was forced to re-launch with two daily flights. Axing both daily flights was too big of a pill to swallow for the local and federal governments and MAS would have been better off reducing capacity in the market, a more palatable alternative, rather than pulling out entirely. In addition to reversing the 12% decrease in capacity, MAS' management team has not met its original goals for improving yields and profitability. In unveiling its new business plan in Dec-2011, the at the time new MAS management confidently predicted it would only post a small loss in 2012 and return to profit in 2013. MAS was banking on a 19% improvement in yields in 2012, as the carrier started focusing more on its premium positioning and cut unprofitable routes. But through the first three quarters of 2012, MAS yields were only up 7% to MYR0.258 (USD5.4 cents). Excluding fuel surcharges and administrative costs, yields actually decreased by 1% to MYR0.196 (USD6.4 cents). MAS still has a long road ahead in improving yields to match its new premium-focused positioning. Not surprisingly the carrier has adjusted its 2012 profit outlook and now only expects to roughly halve its full-year loss from 2011. MAS through the first three quarters of 2012 incurred an operating loss of MYR405 million (USD132 million), compared to an operating loss of MYR975 million (USD319 million) for the same time period of 2011. The company’s net loss for this period was MYR484 million (USD158 million), which represented an improvement of 61% compared to a MYR 1.247 billion (USD408 million) loss for the first three quarters of 2011 (see Background information). For the full year 2011, the carrier’s net loss was a gigantic MYR2.521 billion (USD834 million) but this includes one-time items which makes comparisons to 2012 difficult. In Dec-2011 the carrier’s management team revealed the carrier would be out of cash and bankrupt in 2Q2012 without cutting costs and capacity and embarking on a restructuring effort. MAS did turn a small profit in 3Q2012, its first quarterly profit after six consecutive quarters of losses. On an operating level MAS turned a profit of MYR4 million (USD1 million) and on a net level a profit of MYR37 million (USD12 million). The MAS management team is now confident it can reach its revised break-even target in 2013. But the third quarter is traditionally the strongest quarter for MAS and the carrier will likely be back in the red for 4Q2012. The carrier has an unenviable track record of several failed restructurings and turnarounds in recent years. Typically MAS shows progress after implementing a restructuring, as it did in 2010 by returning to the black. But the past losses have quickly returned as the restructurings have not gone deep enough or addressed the root problems at MAS. MAS will need to make further significant improvements in yield and efficiency in order to achieve sustainable profitability. The carrier has made strides in improving efficiency in 2012 by increasing aircraft utilisation as its fleet has been renewed. 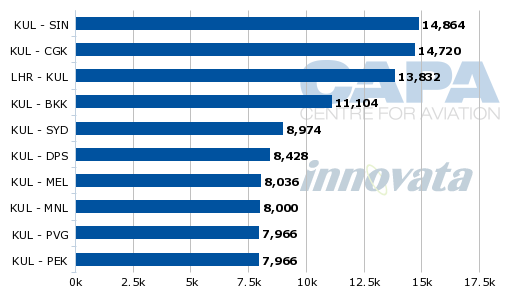 With its narrowbody fleet, MAS has already increased average aircraft utilisation from nine to 11 hours. Replacing 737-400s with more efficient 737-800s has helped these efforts but MAS also launched several internal initiatives aimed at improving employee productivity. For example, turn times at Kuala Lumpur have improved from 60 minutes to 40 minutes on the 737-800 and to 35 minutes on the smaller 737-400. MAS will need to further reduce turn times closer to the industry standard of 30 minutes. MAS has already achieved an up to 15% reduction in unit costs across its narrowbody operation, with about 8% being achieved by increasing utilisation. Further reductions are targeted as MAS needs to further cut the cost of its short-haul operation in order to be more competitive with LCCs, in particular low-cost leader AirAsia. While MAS will never match AirAsia’s cost structure, the carrier sees room for improvement and believes its premium position will support profitability as long as its cost base can be reduced. The productivity improvements require a radical change in mindset and culture as MAS has historically been a highly inefficient government-owned carrier. MAS is now trying to improve efficiency and close the cost gap with rival AirAsia by getting employees to buy into the changes. MAS this time is trying to avoid alienating employees, a smart move given that it will need to provide high quality service to achieve its premium positioning. But this is never an easy task and MAS has a mountain to climb after infuriating employees with its initial restructuring plan. MAS’ original restructuring plan included the establishment of a new full-service carrier to take over the company’s narrowbody operations. But the Sapphire project, as it was known, was extremely unpopular with unions which viewed it as a backdoor way to outsource jobs and reduce costs. MAS had to drop the plan, bowing to union and political pressures. After dropping Sapphire in early 2012, MAS proposed splitting narrowbody and widebody operations while retaining one operating certificate and one brand. The split would have achieved some of the goals of Sapphire but most of the efficiency gains initially envisioned would have been unreachable as only a new division rather than new company would have been established to operate the 737 fleet. The concept was quickly and quietly dropped. Sapphire was a logical short-haul strategy as it would have established a separate regional carrier, similar to the strategy used by Singapore Airlines (SIA) with its regional subsidiary SilkAir. MAS would have been left with an all-widebody fleet, as is already the case with SIA, as 737-800s would be moved to the new carrier. Thai Airways has now adopted a similar strategy as it moves to an all-widebody fleet, leaving its new regional unit Thai Smile to operate narrowbody aircraft on thinner regional routes. The original version of MAS’ new business plan envisioned the new short-haul premium carrier launching by mid-2012 with a focus on regional international destinations in Southeast Asia with high premium demand such as Bangkok, Hanoi, Ho Chi Minh, Jakarta, Manila and Singapore. Domestic flights from Kuala Lumpur to Kuching and Kota Kinabalu were also planned as part of the initial phase. MAS would have been left to focus on medium and long-haul services to North Asia, South Asia, Australasia, Europe and North America. While Sapphire was referred to as a premium airline project, no change in product or configuration was planned. The new carrier would have operated the 737-800s in the same dual-class 160-seat configuration as MAS. While from a marketing perspective the new carrier could have helped MAS reinforce its new premium positioning, Sapphire was indeed a cost play with MAS aiming to lower costs by establishing a new airline with a more efficient workforce and operating high frequency routes of less than four hours under a high utilisation quick turnaround model. MAS is now trying to implement similar efficiencies while retaining the existing MAS-branded 737 operation, a crucial area of its revised business plan it will need to succeed in given the intense competition with LCCs in the regional markets it serves. At about the same time, in Mar-2012, a separate plan for establishing a new regional widebody premium carrier in partnership with Qantas was dropped. This project, known as Orca, could have become a key component of MAS’ business plan as it would have met MAS’ needs to reinforce its premium offering and expand partnerships with other carriers. Talks between MAS and Qantas over the Orca project began in Nov-2011, just about the time MAS’ current management team took over and began working on a new business plan. Orca would have operated MAS-sourced A330s on routes within Southeast Asia as well as to Australia, South Asia and North Asia. MAS was attracted to the prospect of working with Qantas, which is sponsoring its entry into oneworld, and combining the strengths of MAS and Qantas in the Asia-Pacific market. But MAS was not happy with the proposed commercial terms, which had MAS providing essentially all the assets including the A330s and all the traffic rights. MAS did not see Orca as a fair 50-50 joint venture as Qantas was only willing to provide its intellectual property. MAS was also concerned that Qantas would end up controlling the new venture, something the carrier’s shareholders – primarily the Malaysian government – would have never agreed to, particularly as MAS was putting in more than Qantas. Qantas never looked at investing in Sapphire, which was always envisioned as a wholly owned MAS subsidiary. The Qantas Group did look in 2011 at establishing a premium carrier in Asia using 11 of its A320s in low-density configuration. But this project, known as Red Q, was always envisioned to establish a carrier in Singapore for short and primarily medium-haul routes. Qantas dropped Red Q after getting a cold shoulder from Singaporean authorities, which effectively told Qantas that the new carrier would have a hard time securing traffic rights, particularly in the key markets of China and India. At about this time, Qantas shifted focus and started considering a Malaysia option but with a vastly different business model as Orca called for A330s in normal two-class configuration. Qantas has since moved on, putting a potential premium carrier in Asia on the backburner entirely and for now is focusing on improving the prospects of its highly unprofitable international operation through a network restructuring and tie-up with Emirates, which will be implemented in Mar-2013. MAS does not plan to revisit a potential tie-up with Qantas now that the Australian carrier has forged a comprehensive partnership with Emirates. While the Qantas-Emirates partnership focuses mainly on the Australia-Europe market, leaving opportunities for Qantas to find another potential partner in Asia, Emirates is a big competitor to MAS. Emirates is the largest long-haul carrier at Kuala Lumpur, offering over 24,000 weekly seats – including about 19,000 seats to/from Dubai and 5,000 seats to/from Melbourne. Emirates’ rapid expansion at Kuala Lumpur, where it now operates A380s, has made it challenging for MAS to be competitive to Dubai and in the European market. MAS currently only has slightly more capacity than Emirates to the Middle East and Europe, about 27,000 weekly seats. As a result Emirates likely now carries almost as many west-bound long-haul passengers from Malaysia as MAS. Qatar Airways and Etihad have also impacted MAS’ profitability on Middle Eastern and European routes but not to the same scale as Qatar Airways has about half the capacity of Emirates in Kuala Lumpur and Etihad one-fifth. MAS dropped service to Dubai in Jan-2012 as part of its route rationalisation exercise. Competition with Emirates on its Rome, South Africa, Argentina, Karachi (Pakistan) and Dammam (Saudi Arabia) routes also factored into those markets getting axed. MAS is also a large player on the Australia-Europe market, where it will now have to compete with the new Emirates-Qantas combination. MAS now serves five cities in Australia. MAS and Qantas, which currently does not serve Malaysia, would have likely significantly increased capacity between Australia and Malaysia under Orca. MAS also had been looking to expand capacity in Australia by deploying A380s but had to drop those plans after attempts by Malaysian authorities to expand the Malaysia-Australia bilateral failed. With Qantas now unlikely to become a close partner, MAS seems more content to place its A380s on European routes, including London and Paris. MAS already operates double daily A380 flights to London Heathrow and will start A380 services to Paris in Mar-2013. The carrier currently does not use the A380 on any regional routes but is planning to add one regional route within Asia during 2013. The A380 is a key component of MAS’ premium-focused strategy and the carrier has noticed a “halo effect” on London as interest in the super jumbo drums up demand and a new segment of traffic, which MAS is confident it can retain given its strong product. MAS expects a similar impact in Paris, leaving to an overall boost in European sales despite the weak European market, with oneworld membership providing a further boost. MAS is now more likely to pursue a relationship with oneworld member British Airways than its sponsor Qantas. BA could become an important partner for MAS in the UK-Asia market as well as in the UK-Australia market as BA ends its joint venture with Qantas. BA has been considering resuming services to Kuala Lumpur and could potentially change the stop of its London-Sydney service from Singapore to Kuala Lumpur to leverage a potential codeshare with MAS. But the opportunities for a BA-MAS tie-up could be limited in Europe and to North America. MAS, which currently works with KLM to serve a small number of European destinations beyond Amsterdam, could use more partners to cover offline European markets. But London is not an ideal hub for Asia-Europe flows as it involves backtracking. Finnair could be an alternative, particularly if Finnair or MAS launch service between Kuala Lumpur and Helsinki, opening up quick one-stop connections throughout Europe. MAS and Finnair have already started codesharing in Dec-2012 but the relevance of the partnership for now is limited because passengers must go through Bangkok, Singapore or Hong Kong in order to access Finnair’s flights to Helsinki and beyond. MAS also needs a partner to cover the eastern US, where it currently does not have any codeshares. MAS will likely not be able to work closely with BA on services to the US, where BA has a very strong network, because the trans-Atlantic market is covered by an anti-trust immunity joint venture agreement between BA and American Airlines. One-stop services to US markets are also possible via Japan on Japan Airlines (JAL) or American but the issue there is American and JAL already have an anti-trust joint venture covering trans-Pacific routes. In the US, MAS only serves Los Angeles, with four weekly flights via Tokyo Narita. As it is an operator in the Japan-US market, MAS could look to join the joint venture between oneworld members American and Japan Airlines. But this seems unlikely as MAS has such a small presence in the Japan-US market. MAS will need to somehow find another way of working with JAL, which is now one of only three oneworld carriers serving Kuala Lumpur. Cathay Pacific is by far the largest oneworld carrier serving Kuala Lumpur and is the only oneworld carrier with more than one daily flight at the Malaysian capital. (Cathay has four daily flights at Kuala Lumpur while JAL has one daily flight and Royal Jordanian three frequencies per week). But Cathay does not always pursue close partnerships with other oneworld members and may be reluctant to work closely with MAS as MAS focuses more on premium services. MAS will more likely forge a codeshare with Royal Jordanian but the partnership will not be significant as Royal Jordanian only serves Kuala Lumpur via Bangkok. Joining oneworld requires heavy investment as MAS overhauled its IT systems to meet the alliance’s requirements. MAS completed this process in Dec-2012 but the ascension date was delayed until 01-Feb-2013 as the carrier and other oneworld members wanted to wait until after the peak Christmas and New Year season to implement the frequent flier tie-ups which come with alliance membership. The carrier is banking on recouping its oneworld investment and its membership in the alliance helping the carrier expand its premium business. But with limited opportunities for significant partnerships with oneworld carriers MAS may struggle to realise the expected benefits. Still, joining a global alliance was the right strategy and over the long-term should at the very least help MAS build brand awareness globally. MAS has also invested in upgrading its reservation system, call centres, lounges and ticket counters. New service for premium passengers have been introduced at the Kuala Lumpur hub including dedicated security lanes, dedicated immigration on arrival and outbound immigration clearance at the check-in counter. These upgrades are important components in MAS’ attempt to reposition MAS as a premium carrier and win back premium passengers who have defected to competitors in recent years. Overall the new business plan at MAS represents a major change and bold strategic shift. The Malaysian flag carrier, while always striving to offer a top notch product, has struggled over the years to compete with Asia’s leading carriers for premium business. MAS is finally now committed to investing in the products needed to compete with the likes of SIA and Cathay. It is a huge gamble. Wooing premium passengers and securing new corporate accounts is always an uphill battle. Membership in oneworld and brand new aircraft with industry-leading products will help. But MAS will also need to be transformed as a company and be relentless in its drive “to become the preferred premium carrier”. Even after a year of several major adjustments to its new business plan, particularly in regards to capacity cuts and partnerships, MAS is adamant it does not need to reconsider its strategy regarding product positioning and focus on the top end of the market. MAS is confident it can become a leading premium carrier and restore profitability without following all of its rivals in Southeast Asia – including Garuda Indonesia, Philippine Airlines (PAL), Thai Airways, SIA and Vietnam Airlines – in establishing a budget brand. MAS took a stab at a LCC operation in 2011, when it used its Firefly subsidiary to operate 737s and compete with AirAsia on domestic trunk routes. But the Firefly 737 LCC operation was shut in Nov-2011, three months after MAS forged a stock swap and collaboration agreement with AirAsia. While the stock swap was unbundled in May-2012 and MAS no longer plans to pursue any cooperation with AirAsia, MAS still believes it does not need a LCC subsidiary. Indonesia’s Lion Air is now targeting the Malaysian market with a new joint venture LCC which aims to launch service in mid-2013. But MAS does not seem too concerned about the prospects of a second LCC in its local market and remains focused entirely on the premium market. MAS management believes it can selectively compete with LCCs in some lower segments of the market as long as it continues to reduce its costs. Matching AirAsia’s costs are impossible but as long as MAS is successful at attracting a premium from business passengers and high yielding economy passengers, through corporate accounts and travel agents, it will be able to continue matching and even under-cutting some AirAsia fares for select buckets. MAS recognises it will miss out on some lower ends of the market but believes it can offer the right product and services that appeal to all segments it sees as valuable. MAS management believes Firefly’s short-lived LCC operation created confusion among customers and its revised strategy of having Firefly and MASwings focus entirely on the full-service regional model, operating very short routes of under two hours with ATR 72s, has proven to be successful. MAS management also believes Firefly’s 737 operation cannibalised MAS own short-haul operation more than AirAsia’s much larger short-haul operation. As a result MAS is currently not considering establishing a new budget brand. But with the right strategy and product position the MAS group should be able to succeed with a multi-brand strategy that includes a LCC brand and minimise cannibalisation. The experiences of the Qantas, Garuda, Thai, PAL and SIA groups have proven the strategy of having a LCC subsidiary has a home in the Asia-Pacific region despite its earlier failures in Europe and North America. Inevitably, MAS will eventually revisit its short-haul strategy. At MAS, medium and long-term strategy planning is almost constantly in flux, as illustrated by the multiple changes in 2012 to the carrier’s “new” business plan – as well as the several business plans which preceded it in recent years. There is also always a big risk at MAS that political interference will lead to yet another change in strategy. In 2013 this is an even bigger risk than usual as Malaysia will hold general elections in 1H2013. A new prime minster in Malaysia typically means a new management team and strategy at the country’s flag carrier. MAS’ challenges are no smaller than they were a year ago and its outlook, while improved, remains murky. 2012 has been yet another year of one step backwards for every step forward and 2013 could bring similar frustrations for MAS.